Coordinating a baby shower isn’t as hard as you think. 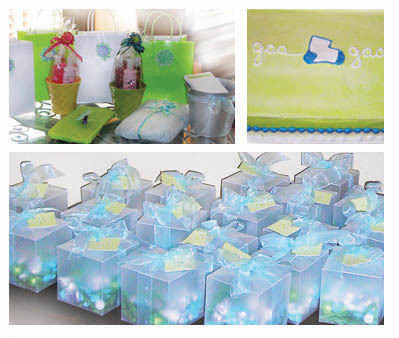 The Simon+Kabuki “Goo Goo” Shower Kit helped a bunch for my baby shower (a while ago). Set up for 24 people, it comes with plates, cups, napkins, games, coasters, clear boxes, basket grass, and stickers. Invitations and thank you notes are included as well. 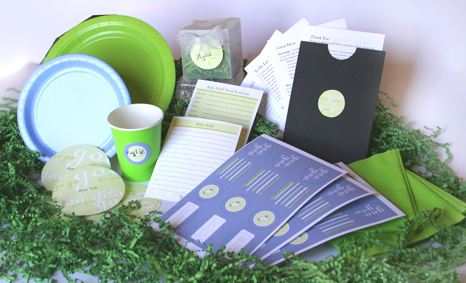 There is even an instruction packet for how to throw an awesome baby shower! Here is some of what my mom and sister came up with using the goodies from this kit. They were nervous to throw a shower for a crazy graphic designer (me?). This took the pressure off and I think they did a great job. My pictures don’t do it justice (I was in dire need of a decent camera back then). The stickers were used to decorate the party prize bags and they added coordinating flower pots and ribbon. The cake was done to match the invitations and the little clear boxes were filled with blue and white m&ms and used as party favors. It turned out so great! You can even get creative and use the coasters as decorations. These kits are still available in Boy, Girl, and Neutral color schemes. If you are interested, please contact us!